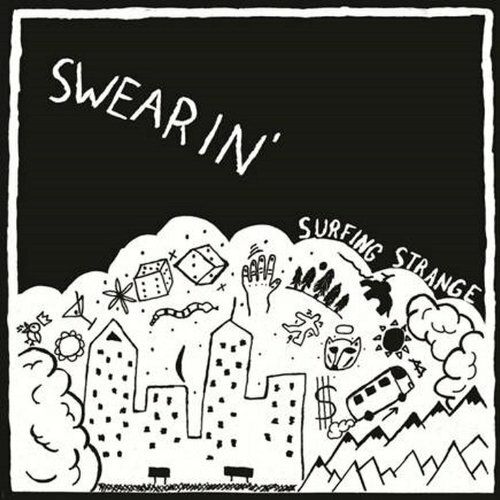 Following up their solid self-titled debut, Swearin’ give us another swampy chunk of 90s alternative rock with their second album Surfing Strange. It’s all in the title, really; this is a collection of fuzzy jams for the 90s-loving, beach-hopping slacker. If you take a listen to the infectious opener ‘Dust in the Gold Sack’ (hint: best song of the album) and think that it sounds quite similar in tone to Waxahatchee’s latest release then you’re on to something. Katie Crutchfield, aka Waxahatchee, is sister of Allison Crutchfield, the singer here. She shares vocals duties on this album. If you could imagine Waxahatchee with a full band then it would probably sound like Surfing Strange, with lines like “Daylight and night on the turnpike/ like the crunch of the black ice and the buzz of the summer”. There is, however, a slightly drab and sludgy feel, with deadpan vocals and lazy, loud strums left to hang buzzing in the air. ‘Mermaid’ is a stoned dreamscape where in the first few minutes the only phrase audible in the backdrop is “life is cheap”. The foreboding second half gives menace to what could have been a wig-out of sound. ‘Melanoma’ uses the simple electric picking of four strings going back and forth to lull you into a false sense of calm before it erupts into clouds of fuzzed-up guitar, like a volcano spews slow and loud. There isn’t a great deal of pace across the album, as Allison and Co are prepared to take their time in building songs; the only downfall is that there isn’t a distinctive payoff. You can hear the revival in the glazed verses and the angsty choruses but the words are often difficult to pick out, with a sense that they aren’t given as much importance as the sound itself. ‘Glare of the Sun’ gives a sunny beach feel in slow-motion over simple piano between the book-ends of overdriven riffs. This band are at their best when they are either super slow (‘Loretta’s Flowers) or punchy and brisk (‘Unwanted Place’), but there is a fair bit of muddling between the two which holds them back. Yet another solid 90s-influenced album to add to the collection for anyone missing those sludgy guitars and disaffected teen vocals. ‘Young’ has the kind of effortless hook which makes you want to keep this band to yourself before they’re 'discovered' on an indie movie soundtrack. It’s that feeling which makes a band like this satisfying; they’re you’re secret to hold close and flaunt as an obscure gem to friends. It'd be good if these guys toured the UK.